In the email footer of your campaign, the subscriber clicks the Forward button. 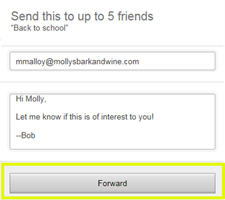 They can enter up to 5 friends' email addresses, include a short personal message, and then click the Forward button. The campaign is delivered to the subscriber's friends in the form of a forwarded email message. Since the campaign was merely forwarded, the people receiving the campaign aren't subscribers yet. It's a good idea to include a call to action to subscribe. On your stats page, you can see how many times the original campaign was forwarded, and by whom. You can't see the email addresses of the people they were forwarded to until they subscribe.